eddy-resolving ocean model to study acoustic propagation through frontal systems. The effects of eddies on acoustic propagation were investigated by Vastano and Owens (1973) using ray-theoretical models. More sophisticated wave-theoretical models have since been employed in more comprehensive studies. For example, Baer (1981) utilized a primary 3D version of the parabolic equation to study propagation through an eddy, and Hall and Irving (1989) used an adiabatic normal mode technique to investigate propagation through Baer's example of an eddy. All investigators indicated that eddies significantly modify major characteristics of the acoustic field relative to those obtained in the absence of eddies. Such effects include the shifting of convergence zones, altered multipath arrival sequences and horizontal refraction, among others (Munk, 1980). In a comprehensive study of warm-core eddies, Browning et al. (1994) found that the greatest acoustic impact was obtained for a shallow source and receiver configuration. Tsuchiya et al., 1999 used a 3D wide-angle PE model to analyze acoustic propagation through an ocean populated by warm- and cold-water masses approximating the characteristics of eddies in the Pacific Ocean. The 3D model computed horizontal and vertical refraction for comparison with 2D results. Relative to the 3D model, the 2D results underestimated the effects of eddies on acoustic propagation. Shang et al. (2001) proposed a new, less restrictive, criterion for adiabaticity in the presence of ocean fronts or internal solitary waves in shallow water. 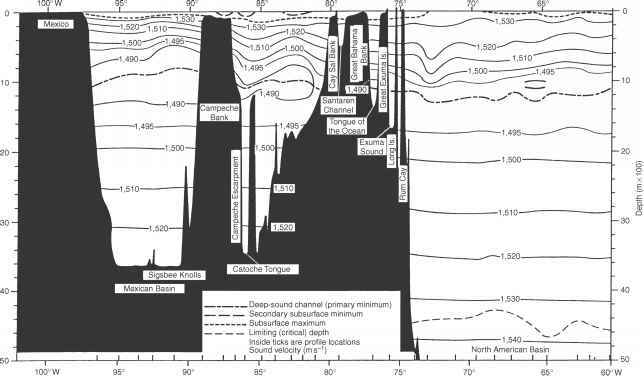 As an illustration, the results of Vastano and Owens (1973) are used to quantify the effects of a cold-core eddy (surrounded by warmer Sargasso Sea water) on acoustic propagation. Assuming a frequency of 100 Hz, a source depth (S) of 200 m, a receiver depth (R) of 300 m, and a FOM of 90 dB (see Chapter 10), the resulting TL curves in Figure 5.16(a) would result in the detection zones in Figure 5.16(b) for a sonar located both inside and outside the eddy. The shaded areas denote detection opportunities under the stated conditions. The shifts of the convergence zones are readily apparent as one effect of the eddy. The particular situation illustrated in Figure 5.16 could arise, for example, if a sonar were located on the outer edge of an eddy, with the eddy on the left and the Sargasso Sea on the right.